If you live in the Northern Hemisphere, there are going to be many times of year when rain and cold weather prevent you from having outdoor fun. Similarly, in extremely hot regions, people need a climate-controlled area to enjoy activities all year round. 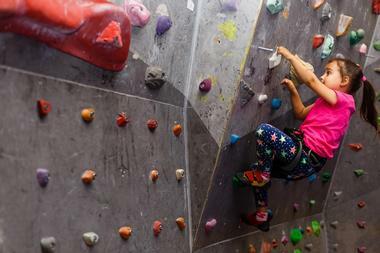 To meet the need for things to do when the weather is unfavorable, several remarkable indoor amusement parks have been built to provide year-round fun, thrills, and spills. Some have been around for many years and others are brand new, but all of them are paving the way for further expansion and innovation in the field of indoor amusement. Come and step into a world of year-round fun in some of the best indoor amusement parks in the world. When freezing conditions make outdoor fun difficult, it makes great sense to move all the fun indoors, which is just what they have done at the West Edmonton Mall, where Galaxy Land provides hours of fun for young and old. 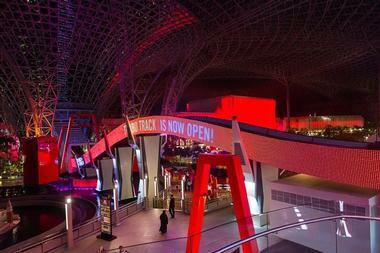 Galaxy Land is the largest indoor amusement park on the planet, featuring 27 action-packed rides to thrill all ages. Highlights of your visit will include the 14-story Mind Bender and the terrifying 36-meter Space Shot, which is the tallest indoor tower ride every built. Families and younger visitors will love the Galaxy Land Express, a miniature train offering a leisurely ride through the park. 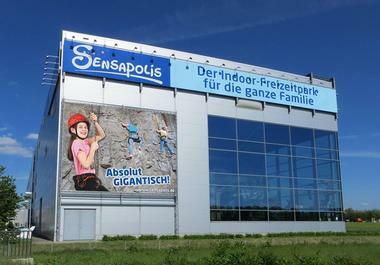 Located on an old airfield in Sindelfingen, the Sensapolis indoor amusement park is the ideal place to take your entire family to have fun. The park has a wide variety of activities to suit all ages (including younger visitors less than 5 years of age), and you can choose from whizzing down some of the 16 slides, tackling the high ropes course, or getting your adrenaline pumping on the flying fox zipline. Younger visitors will love the Fairytale castle and the giant wooden pirate ship, and everyone loves the waterpark. Adults and older children will enjoy the interactive Our Place in Space exhibit and the science center. There is also a dedicated area for toddlers to have fun. 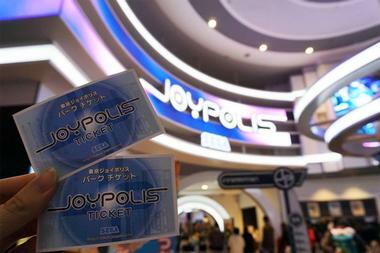 The Joypolis indoor amusement park is set to thrill all ages with a bumper line-up of 22 attractions spread over three floors. The attractions include roller coaster rides, simulated river and jungle tours, and an interesting mix of other rides and interactive fun exhibits including the world's first Concert Coaster. Some of the attractions are only presented in Japanese but printed guides are available in English. The rides are all individually priced and if you choose to visit at night (or late night), there is a reduction in admission prices. There are also a variety of combination tickets that reduce costs, and if you visit on your birthday you get in for free. Lotte World is certainly the largest indoor entertainment park in Asia (possible the largest in the world), where people of all ages can spend hours having fun regardless of the weather. Lotte World brings Disneyland to Asia, encompassing a theme park where you can enjoy many hair-raising roller coaster and other rides, an innovative folk museum, a huge ice rink, and the Magic Island, which is an outdoor area surrounding Lake Seokchonhosu (this part of the park may be affected by bad weather). The park features fun parades, top musicals at the Charlotte Theater, laser shows, hotels, shopping, dining, and even a spa. Abu Dhabi's famous Ferrari World is a must-see United Arab Emirates attraction for all motor enthusiasts and everyone who loves a great amusement park. The park is uniquely Ferrari themed, offering visitors the chance to stroll through the fantastic Galleria Ferrari, which is home to an ever-changing display of rare Ferrari models, before you get strapped into your seat to experience 240 km/h G-forces on the Formula Rossa, the fastest roller coaster on earth, or the Flying Aces, the tallest. 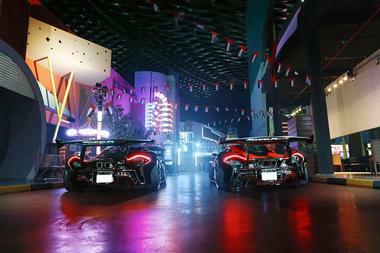 Of course, there are also many other less terrifying rides to experience, and younger visitors can have hours of fun at Khalil's Car Wash, Junior GT, and Junior Grand Prix. You can also stock up on Ferrari-themed gifts at the shop. Offering visitors over 5 acres of indoor fun and games, the Adventure Dome at Circus Circus Hotel is one of the most popular Las Vegas attractions for families. In the dome you will find a wide selection of rides, including the Canyon Blaster and El Loco roller coasters, bumper cars, swinging pirate ships, and the dreaded Inverter. 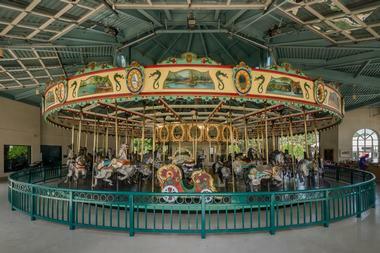 There are also a variety of gentler rides for younger visitors, including the BC Bus, Circus Carousel, Frog Hopper, and Miner Mike. In addition, you will find laser games, arcade games, free clown performances, and much more. If you are planning to go on several of the individually priced rides, you will find that an all-day ride pass is the most economical option. 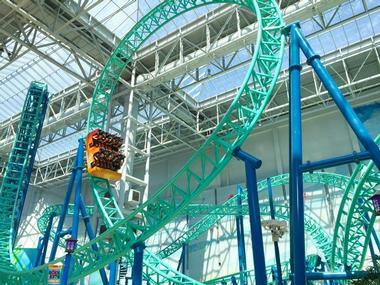 Located in the Mall of America in Bloomington, Minnesota, Nickelodeon Universe promises hours of great indoor fun regardless of the weather. The large indoor amusement park is spread over 7 acres in the center of the mall and gives visitors the chance to meet their favorite TV characters (like SpongeBob, Dora, and the Teenage Mutant Ninja Turtles) face to face and have the time of their lives on 27 thrilling rides. A few of the highlights include the Avatar Airbender, Brain Surge, and Jimmy Neutron's Atom Collider for daredevils, while families gravitate towards the Crazy Cars, Big Rigs, and Barnyard Hayride. Parthenon at Mt. Olympus is a Greek-themed indoor amusement park at the Mount Olympus Water Park and Theme Park Resort. At the Medusa's Indoor Water Park, visitors can enjoy water slides, arcade games, and a variety of indoor rides when bad weather puts a hold on the outdoor activities. 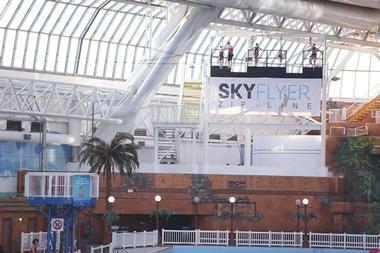 The indoor waterpark features several water slides, a Mayan-themed tube float, and two large whirlpools/hot tubs. The Parthenon Indoor Theme Park offers several rides mostly aimed at families with younger children. 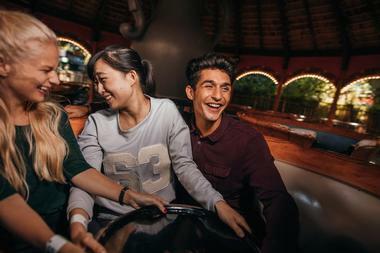 Teenagers will enjoy the bowling alley, adventure course, and arcade, and when the weather improves everyone can have loads of fun on the thrilling roller coasters in the outdoor theme park.